Palm Royale Country Club. Golf Palm Royale La Quinta. Palm Royale golf course details and information about Palm Royale Country Club in La Quinta, California. Palm Royale La Quinta has a public 18-hole golf course, designed by Ted Robinson. It is a challenging course that features long fairways with strategically placed lakes and sand traps. 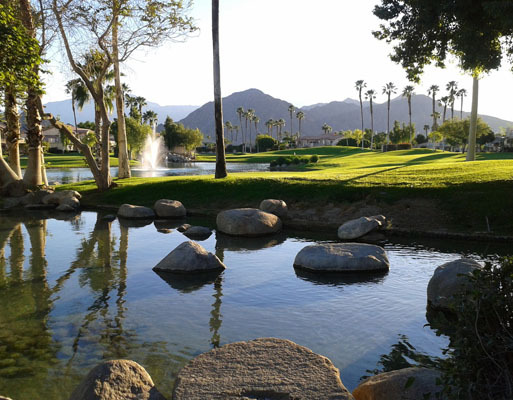 Palm Royale golf La Quinta has greens that have been positioned to challenge novice and professional golfers alike. The Palm Royale Country Club is a par 3 and 1992 yards long. It has a 51.8 rating and a 113 slope. The fairways vary from 71 to 150 yards. There are 6 distinct condominiums, all overlooking the golf course, featuring their own tropical style pools and Jacuzzis. The Palm Royale Country Club also includes 4 regulation hard surface tennis courts.